Before commenting on the subject of idol worship, I would like to mention a few things that may help you to grasp the subtle truth behind such a practice. Osho makes mention of a certain Doctor Frank Rudolph who wanted to know about a certain practice performed by an African tribe. What he discovered among those people is that they would make a statue of a particular person using mud. Then if they have to cure that person of any illness, they would touch the appropriate part of the statue and the person would recover. In the same way, they could also cause any illness in that person if they so wished by touching a particular point on the image. This practice is called voodoo. This may sound incredible to most rational people but it is possible indeed and experience has proved it. How is this possible? When the statue is being moulded or the picture is being drawn, the image of the said person should be brought at the third eye. And if one's mind is totally focused at this point, it can be done without the medium of a statue or an image. Distance healing is based on a similar principle. Thought waves are very subtle, they can be transferred at incredible speed through space. This can be performed with willpower. After all, existence is homogeneous. In a state of silence all psychological barriers are broken. Coming to idol worship, let it be very clear that if worship stops at the statue or the picture, then it is idolatry. The truth, however, is that idols are a means to reach the formless aspect of God. Form is used as a means to reach the formless. Many people talk about praying or worshiping directly, but this is impossible – no one can make it. Whether it is a mosque, a temple, a scripture, rites, rituals, prayers, meditation techniques, a prophet or a guru, all are forms and only means to reach the formless. Yes, it is absolutely true that people stagnate with idolatry, thus missing the opportunity to experience the formless. Though there is absolutely no barrier between God and man, the latter has built many barriers, the very first one being man himself. Then in between also come his beliefs, conditionings, emotions, thoughts, scriptures and so on. Mind is form and thus limited, how then can it conceive the formless? Any conception will be a form. One of the Ten Commandments is, "Thou shalt not make any image of God." The commandment is from Moses. During his time, people were blinded by idol worship; they were doing it irrationally. It was not used as an experiment to attain enlightenment but as an egoistical practice for personal satisfaction, out of fear and other reasons. Therefore the commandment was necessary. 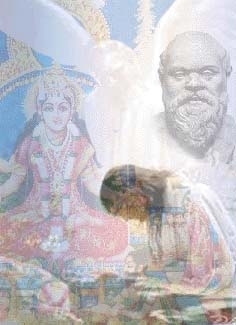 In ancient India, the mystics had discovered it as a means to reach the formless. I had a friend who belonged to a religion that prohibits image worship. One day I asked the fellow, "How do you pray, I mean, how do you conceive God?" "I think of Jesus or God directly" was the answer. "But," I said, "if you think of Jesus, it is nothing but your imagination, meaning you are worshipping your thought." And for that matter, the images of Shiva, Krishna, Vishnu and so on are our own creation! Even the science of meditation is based on practices where form plays an important part. While meditation itself is the formless aspect of our being, the methods that lead to it are nothing but means based on forms. Though there are many subtle methods like watching the breath, the thought process, nevertheless they all have to do with certain forms – though subtle, still they are forms. Only the enlightened beings have transcended all forms and thus dwell in the formless. Kabir has said, "I dwell in the formless and I sing the glory of the form." But for him, form was the whole existence. Even a great master like Ramakrishna had to pass through the form aspect of God before realising Him. His realisation is an example of the efficiency of image worship to reach the formless. There have been many other such cases; I have myself experienced form. However, worship and prayer are methods for those on the path of devotion. Those on the path of knowledge, here I am not referring to bookish knowledge, will use this method as a means. I would like to make it clear that apart from someone who has attained enlightenment, everyone is an idolater. If we can focus on an enlightened being with concentration, receptivity and love, then he can become a door to the formless. An enlightened one is a door because the person or the ego is not there, only God is. Here it is good to quote Kabir, "When I was, that is, when the ego or the lower self was, then the Lord was absent. Now I am not, the Lord is." Jesus has said, "No one comes to the Father but by me." Krishna said, "Shanti ka sidha marg mein houn," meaning "I am the direct way to peace." Through the form of the blessed one, we can easily enter into the meditative state, which is nothing but the state of godliness. Masters who have trodden this earth still have their field of vibration somewhere in space and by concentrating on any one of them, we can attract his energy upon us, which can lead us to meditation.